From the jacket copy. Few expressions of New Age spirituality evoke greater skepticism and derision than does channeling, the practice of serving as a vessel for the voices of ancient or otherworldly beings. Channelers claim to be possessed by angels, aliens, and “ascended masters” who speak through them, offering advice and solace. Intellectuals dismiss them as cranks and charlatans; evangelical Christians accuse them of trafficking with Satanic forces. Meanwhile, the steady spread of channeling from the West Coast to the American heartland fuels the fear that the United States now confronts an epidemic of public irrationality. 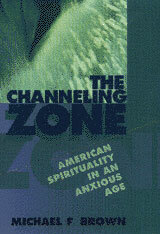 The Channeling Zone reveals that this controversial practice has deep roots in earlier forms of American spiritualism while manifesting the most current concerns and anxieties of American life at the end of the twentieth century. Basing his analysis on dozens of interviews with practicing channels and extensive participant-observation research in New Age workshops, Michael Brown takes readers into the world of those who find meaning and inspiration—and occasionally a lucrative career—in regular conversations with spectral beings. Drawing on his previous research among Amazonian Indians, he brings a historical and comparative perspective to the study of this flamboyant expression of contemporary spirituality. Neither a debunker nor an advocate, Brown weaves together the opinions and life stories of practicing channels and their clients to bring their world and its assumptions into higher relief. He describes the experiences that lead often highly educated, middle-class Americans to conclude that useful information is filtered through the spirit world. He pursues the nature of the quest—the fears, hopes, and expectations of the seekers—and finds its roots in traditional American notions of individualism and self-perfection. The Channeling Zone is a lively journey into the complex social world of the thousands of Americans who have abandoned mainstream religions in search of direct and improvisational contact with spiritual beings.